Lilith is furious with what Simon has managed to do to her human sacrifices. She knows who gave him his mark, and sets her sights on the Seelie Queen. With Lilith distracted, Isabelle, Alec, and Magnus can work on freeing Jace from his possession. The trio is going to need all the time they can get, as freeing Jace is complicated and emotional. Magnus works on the outside to get Isabelle and Alec into Jace’s mind. Within his mind, Jace is forced to kill and lose his loved ones, just like the nightmares we’ve seen earlier. It takes some work, but with the support of Isabelle and Alec, they are able to free him from his torture. Up until now, we haven’t seen Jace break down; he has handled everything thrown at him with minimal reaction. Lilith has pushed him too far– he’s too tired to keep fighting and breaks down in Alec’s arms. His release is brief because Lilith has her sights set on retrieving him. Lilith is feared by quite a lot of people, but I didn’t think the Seelie Queen would be one of them. But with power like Lilith’s, who can wipe out Seelie forces in a blink of an eye, even the Queen would be nervous. Lilith wants the Queen to remove Simon’s protection, but instead, she offers Jace’s location so she can retrieve him. It’s excellent trade, Jace as the Owl is incredibly valuable to Lilith, so she takes it. Poor Jace, he was just freed, and just as quickly he’s back in Lilith’s hands. Magnus is no match against Lilith, and Isabelle and Alec’s hard work is for naught. While this goes down, Clary is facing court in Idris. Luke knows this is a dangerous problem– she could be put to death if they so willed it. 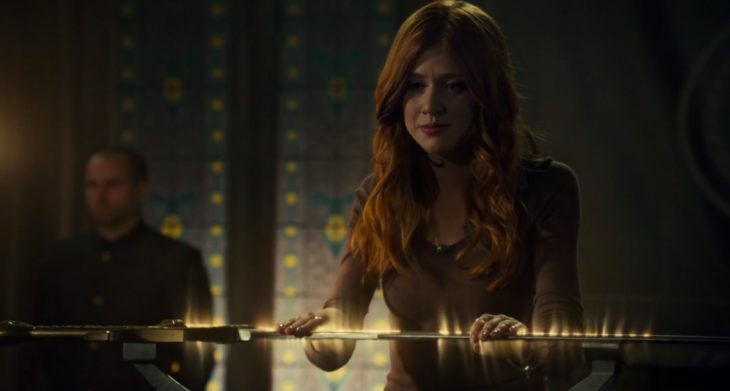 During the interrogation, Clary is forced to tell the truth of what happened to Jace that night with Valentine, leading up to him being possessed. No one is pleased with her choices, and Clary doesn’t seem to care. She loves Jace, and using a wish from an angel is a small price to keep him alive. For her defiance, she will be put to death. Unbeknown to her, Luke is about to enlist a feral pack of werewolves to help break Clary out, but that’s asking for war. No one made it out without losing someone important, especially Simon who is looking into Lilith’s whereabouts with help from Maia and Jordan. They make little progress, as Maia can’t handle being around such an apologetic Jordan. Being around him stirs up terrible memories that she can’t control. To protect those around her, Maia chooses to leave for a little while. She needs it; Maia is incredibly strong, but Jordan is acting like the past can be forgiven. The future isn’t looking good; everyone is split up from each other and Lilith is set to continue to ritual. I’m not sure how things can get better from here, it looks like it’ll only get worse.